Although Leiter is much less of a field agent than 007, his knowledge and expertise have often arrived for Bond just in the nick of time. Leiter slowly becomes the closest thing that Bond has had to a friend, as shown by 007's extreme reaction to his torture in Licence To Kill. He has also been played by Jack Lord (Dr No), Cec Linder (Goldfinger), Norman Burton (Diamonds Are Forever), David Hedison (Live And Let Die, Licence To Kill), John Terry (The Living Daylights) and Jeffrey Wright (Casino Royale, Quantum of Solace). "Well, hello Double-Oh... [Bond punches him to shut him up] Fine way to treat the CIA!" Although Bond and Leiter have become quite good friends, not much is known about Felix's private life. Leiter appears to have somewhat of a sense of humour, but his interests are unknown. During Operation Thunderball, James Bond first encounters Felix Leiter in his hotel room, where the CIA agent is waiting for his British ally - unbeknownst to 007. Caught by surprise, Bond punches Leiter to avoid him blurting out his code-name to the goon hiding in the shower. Leiter has been assigned by the CIA to help track down the two atomic bombs being held to ransom by SPECTRE's #2, Emilio Largo. As with the Dr No mission, Leiter proves an essential ally to Bond in the Bahamas, providing knowledge, contacts and resources. After 007 discovers the location of the bombs, it is Leiter who rescues Bond from a cave - just in time to organise a raid against Largo. Rik Van Nutter was born Frederick Allen Nutter on 1st May 1929 in California, USA. His acting career began in 1959 with an uncredited role in the Italian comedy/horror movie "Tempi Duri Per I Vampiri". A few minor roles in European movies lead to him landing the part of Freddie in Peter Ustinov's "Romanoff and Juliet" in 1961. Van Nutter occasionally took the stage name of Clyde Rogers for his European films. 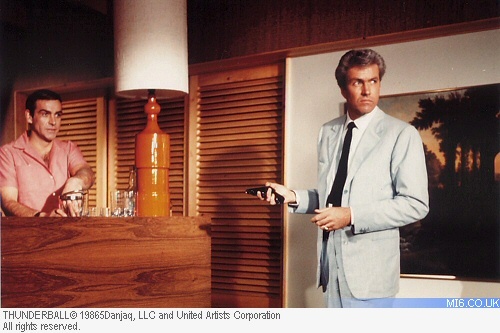 His most famous screen appearance was that of Felix Leiter in the 1965 James Bond film "Thunderball". He was the third actor to play the part, following Jack Lord in "Dr. No" and Cec Linder in "Goldfinger. Unfortunately, Van Nutter falls in to the trap of trying to play the character both serious and cool, and fails to convince the audience. There is no light relied in the script either, with Leiter playing a wooden straight-man in every scene he is involved with. John Terry would suffer a similar problem years later in "The Living Daylights". A couple more low-key European movies followed in successive years after "Thunderball", before he took a ten year break from acting. This was due in part to his marriage to Swedish model and high-profile actress Anita Ekberg, who he wed in 1963 (it was her second marriage after divorcing Anthony Steel in 1959). He flirted with screen-writing, penning the 1971 film "Casting Call". Following his divorce from Ekberg in 1975, Van Nutter returned to the silver screen in 1977 for the Hong Kong flick "Woo Fook", before his final appearance in the World War II movie "Pacific Inferno" in 1979. Van Nutter retired from the industry to lead a private life, marrying Emily Frankel Von Nutter in 1998. The couple divorced five years later. 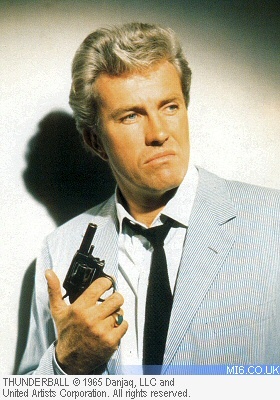 Rik Van Nutter died on 15th October 2005 at age 76 in West Palm Beach, Florida, USA from a heart attack.